Stumbled and now a must have! I stumbled on the Milton Mini Portable Soother Steriliser at Woolworths but didn’t think nothing of it. And then I came across it again at Baby Bunting. After a month of seeing it in stores, I decided to check it out and thought it might be useful since Ayden drops his Dummy a lot! And even with the Dummy pinned to his clothes, it just goes on everywhere, tables, cot, floor and etc. And when I finally decide to purchase it, Neither Coles nor Woolworths stock it anymore! And I had to settle for a less attractive color at Baby Bunting. It costs about $10 and comes with 10 mini sterilising tablets. 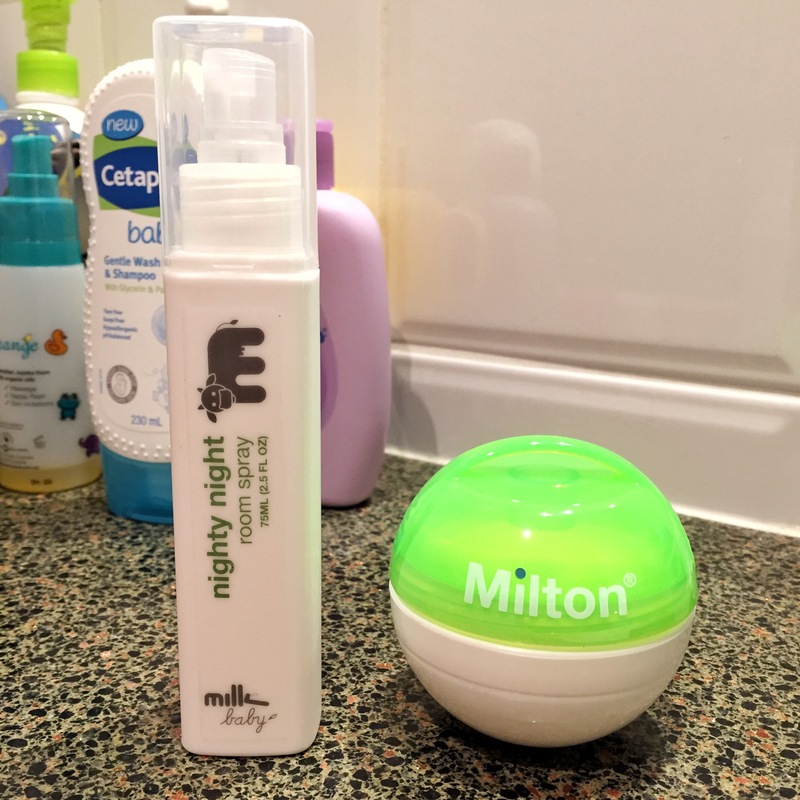 The Milton Mini Portable Soother Steriliser cleans and sterilises dummies on the go in only 15 minutes. The great thing is that you can reuse the same solution throughout the day and the adjustable strap means you can attach the Mini to your buggy or change bag so you can make sure you always have a sterilised soother to hand. Before leaving home, simply fill the Milton Mini with cold water and add one Milton Mini Sterilising Tablet. The unique sponges inside the Mini absorb the solution to avoid spills as well as helping remove dirt from the teat. Add the soother, replace the watertight lid and after only 15 minutes the soother is sterilised and ready to use straight away with no need to rinse. Another stumbled upon product! Was at Chemist Warehouse while picking out monthly necessities for Ayden and came across Milk & Co product range. What attracts me was the Nighty Night Room Spray! I was sceptical at first but since it was on special; any two products for $15. I decided to purchase it and try it out on Ayden! So we had our regular bath time in the evening, massage and a little playtime, decided to spray it around the room and in his cot and bedding. Less than 5 minutes into it, he fell asleep on my arms! It was amazing! Although it was his regular hour nap after his bath, I tried it again during bedtime and amazingly he sleeps soundly! This is part of our nightitme routine now! Now i can’t wait to try the other products in their baby range! This will definitely be one of those items I’ll pack together with the other essentials to make it into a Mummy Survival Kit for my gorgeous expecting girlfriends! PS: Michael Klim and his wife created the Milk & Co range.